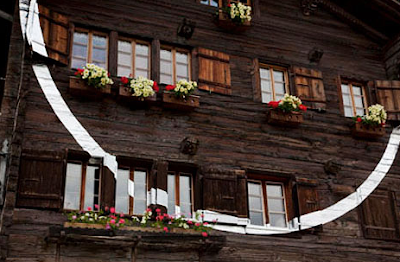 Felice Varini is known for creating illusions of flat graphics on 3 dimensional spaces. From a fixed viewpoint these graphics will look falt. 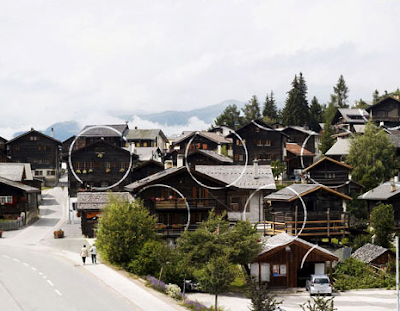 His latest project Cercle et Suite D'eclats takes on the challenge of working at a much bigger scale, the scale of a village. 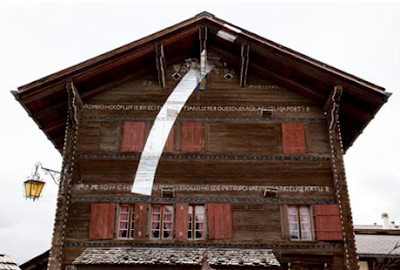 In this project, he superimposed perfect circles on a town called Vercorin in the Swiss Alps. From within the village, the graphics are fragmented and don't make much sense, but from a distance, the lines form a series of rings!!! More of his work after the jump. That's amazing, very funny thanks for share it.